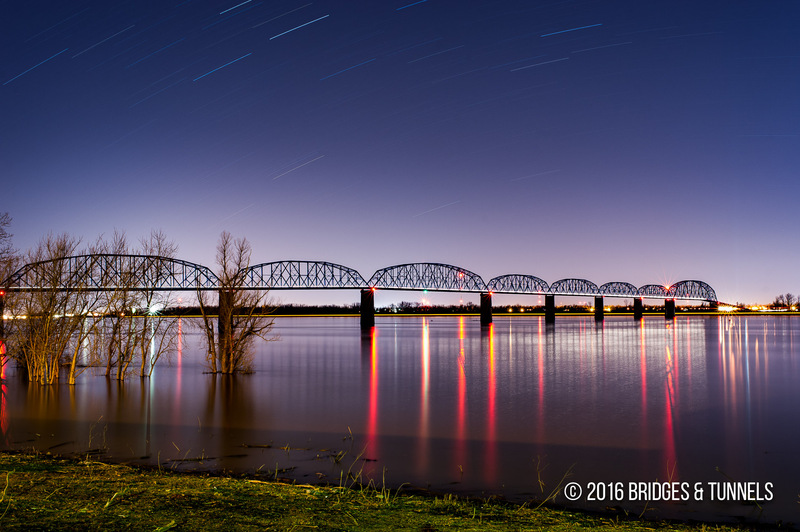 The Brookport-Paducah Bridge carries US 45 over the Ohio River between Brookport, Illinois and McCracken County, Kentucky. 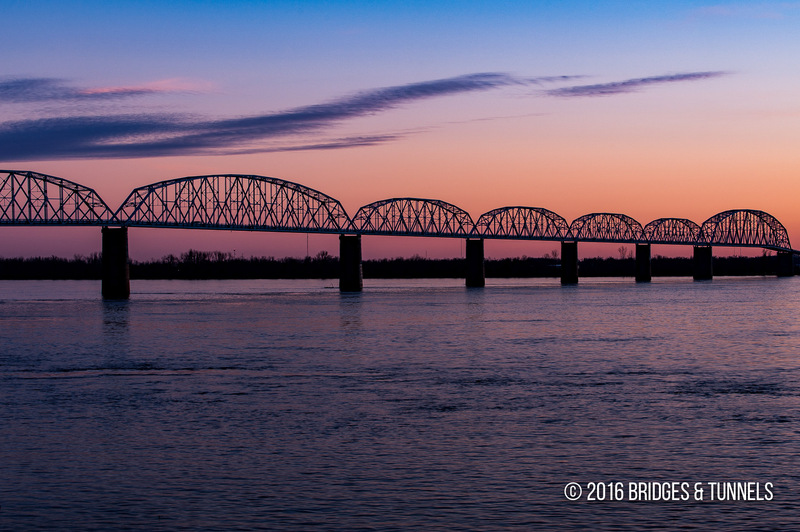 A need for a fixed crossing over the Ohio River at Paducah became paramount as automobile use increased in the region during the 1920s. The Paducah-Ohio River Bridge Company was formed, with Richard Rudy acting as president of the committee that also included Charles G. Vahlkamp, Con W. Craig, W. F. Bradshaw, president of the First National Bank, and Harry L. Meyer, a local jeweler.4 A contract was for $2 million was awarded to the Paducah-Ohio River Bridge Company in 1927 for a bridge over the Ohio River near Paducah, with work beginning that fall.3 Harrington, Howard and Ash served as the engineering firm for the bridge, which was constructed by the Rouse Construction Company, the Union Bridge and Construction Company and the Wisconsin Bridge and Iron Company of Milwaukee, Wisconsin. The ten-span, two-lane crossing was opened to traffic on May 8, 1929.4 5 Those involved with the planning of the bridge celebrated at the Hotel Irvin Cobb. On November 24, 1943, Kentucky Governor Johnson attended a “free bridge” ceremony and declared that the construction bonds for the Brookport-Paducah Bridge had been paid off and that the then-current 50-cent toll would be removed.2 Johnson noted that a fire had “crippled” the bridge in the spring of 1942 and that the damage was so extensive that the bridge might not have become toll free for a number of years had it not been for continued support from the motoring public. The desire to remove the tolls increased with each passing year. On October 15, 1943, Massac County, Illinois threatened to sell the Illinois end of the Kentucky-owned toll bridge for nonpayment of taxes that amounted to $29,000.2 The annual threat was due to Kentucky’s refusal to pay taxes on the Brookport-Paducah Bridge or any other publicly owned bridge that crossed the Ohio River into other states. The ceremony was Johnson’s sixth since his inauguration.2 He had previously attended a “free bridge” ceremony in Catlettsburg when the Catlettsburg-Kenova Bridge (US 60) became toll free. 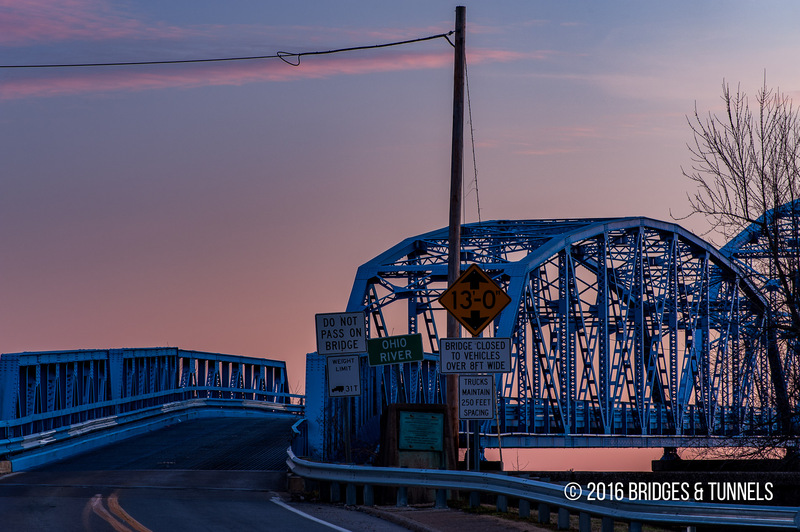 The bridge was then named for Irvin Cobb. Johnson, Keen. “Paducah-Brookport Bridge Becomes Toll Free.” The public papers of Governor Keen Johnson, 1939-1943. Ed. Frederic D. Ogden. Lexington: University Press of Kentucky, 1982. 283.Print. Robertson, John E. L. “World War and Depression.” Paducah: Frontier to the Atomic Age. Charleston, SC: Arcadia, 2002. 76. Print. Powell, Bill. “Transportation.” Mccracken County, Kentucky History Book. By McCracken County Genealogical-Historical Society. N.p. : Turner Publishing Company, 1989. 25-26. Print. Channing, Steven A. “Paducah.” Encyclopedia of Kentucky. 3rd ed. Vol. 1. St. Clair Shores, MI: Somerset Publishers, 2003. 240. Print.